In the previous post, it was shown the results of identification of the SISO models of the suspended robot. In this post it is shown how to assemble SISO models into MIMO model, and the results obtained for our project. The results are still for the suspended robot. It is still needed to invert this model in term of dynamics for us to be able to create a controler to make it stand. You can find a simple and quick explanation of the process here. 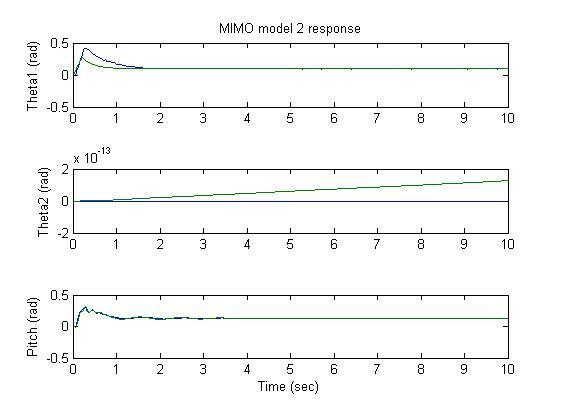 This works not only for our case but for all assemblies of SISO models into MIMO models. A precaution to have is to ensure that your project can be described by a set of SISO models. To finish this post i provide a low quality sample of what you can find in the document. This entry was posted on August 23, 2011 at 9:54 pm and is filed under Uncategorized. You can follow any responses to this entry through the RSS 2.0 feed. You can leave a response, or trackback from your own site.